The launch of the new Twenty-8-Eight collection of DeWitt is an inspired evolution of the brand, as it harmoniously integrates a more classical style and extremely pure lines and patterns into its unmistakably recognizable DNA: the imperial columns on the flanks of its case. Offering a subtle combination of character and refinement, the design of the new Twenty-8-Eight collection is sober and balanced. Presenting a slightly thinner case and more discrete columns on its flanks, the new Twenty-8-Eight collection gives a fascinating impression of lightness, however without denaturing the brand. This new addition to the DeWitt family also intends to pay tribute to traditional watchmaking techniques and in particular to the historical 18th century guilloché machines still used today by the DeWitt artisans. The Twenty-8-Eight collection fully valorises the deep know-how of the DeWitt Manufacture through extremely high quality finishings that enable light and shades to delicately play with volumes and colours. Imagined and first committed to paper on August 28, the new “Twenty-8-Eight” is also a friendly wink to Mr de Witt’s illustrious ancestor, Napoleon Bonaparte, proclaimed “Emperor of the French” by the Senate on 28 Floréal of the French republican calendar. Twenty-8 is therefore a reminder of Mr de Witt’s imperial heritage, but as well as of the true passion for watchmaking that has accompanied his family throughout generations. The new Twenty-8-Eight Automatic is an “urban classic” timepiece, remarkably refined and sober. The 43 mm round case presents particularly comfortable proportions as it is slightly thinner (10.28 mm) than the Academia collection. Lines are also softer, as the flanks of the case are adorned by 48 small imperial columns. 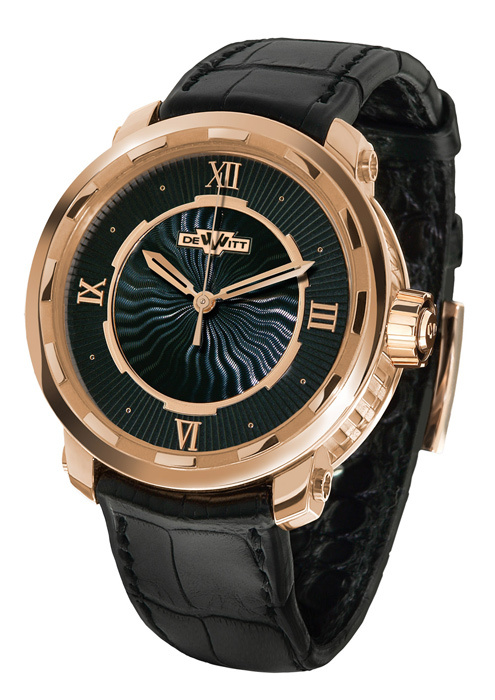 Displaying hours, minutes and centre seconds, its black velvet face is artistically divided in two different guilloché zones: a light flame pattern providing incredible life to the centre of the dial, then surrounded by an elegant and reassuring sunray pattern that structures the whole design. Flames and sunrays are separated by a refined circle applique that echoes the thin and shiny columns on the bezel. Time is indicated by fine roman numerals positioned on the four cardinal points and discretely interconnected by small cabochons. The DeWitt rotor, designed in-house, is visible through the sapphire crystal back. Finally, two miniature “W” signatures are to be found on the crown and on the golden buckle.